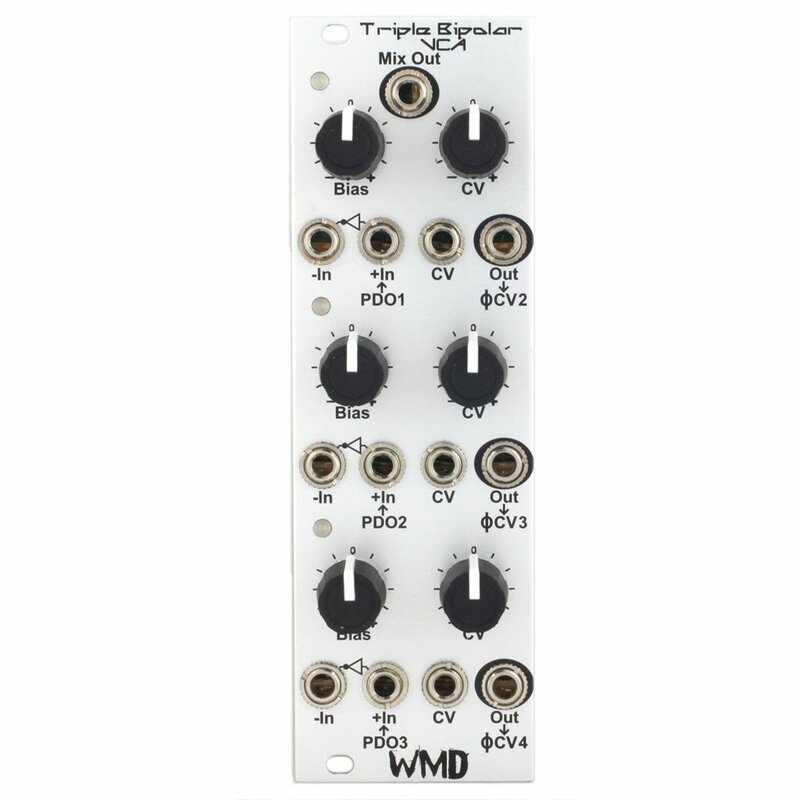 Intoducing the WMD Triple Bipolar VCA, the input side expansion for our Phase Displacement Oscillator. This module provides dedicated inverting/polarizing/bipolar amplitude modulating inputs normaled to the Phase Modulation inputs on the PDO. A bipolar VCA is like a normal VCA when operated with positive control voltage. But when using a negative control voltage, the output will swing back through zero amplitude and the output will be inverted. This produces deeper modulation than a normal VCA. The Triple Bipolar VCA is also designed to be used as a standalone module, it does not require the PDO to operate. + In - This is the normal input for each VCA channel. It drives the inverting side of the Bipolar VCA. These inputs are normaled from outputs on the PDO. - In - This is the second input for the VCA channel. Normaled through this jack is the inverted signal from the + Input. Plugging in here converts the channel from a Bipolar VCA to a dual VCA. Negative control voltages will open the - side, and positive control voltages will open the + side. This allows you to use two modulation sources and alternate between them, while still retaining control over amplitude. CV - This input jack drives the CV knob. It can handle unipolar or bipolar signals. Out - This is the output of each VCA channel. They are normaled to the Phase Modulation inputs on the PDO. Bias Knob - Sets the manual gain for the VCA. Centered will have a zero output (with 0V control voltage). CV Knob - This knob is a bipolar attenuator for the signal applied to the CV jack. Spin clockwise from center for positive CV interactions, counterclockwise to invert the CV. Mix Out - This output jack mixes the signals from each VCA. The Triple Bipolar VCA is 8HP. Current consumption is 80mA for the +12 rail; 75mA for the -12 rail. The depth from the back of the panel is roughly 25mm. The TBVCA is warranted for 12 months after purchase. Please contact us if you ever have problems. We will take care of you.